Click here to visit the Farm Rich facebook and like them. Then on the “First Friday” tab, click the image and it’ll take you to the form. Just fill it out to enter their sweepstakes. 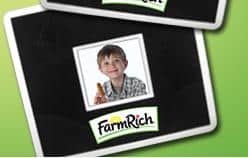 100 winners will score a free Farm Rich Digital Photo Frame (approximate retail value of $19.99). You’ll have until September 13th to enter. Good luck!